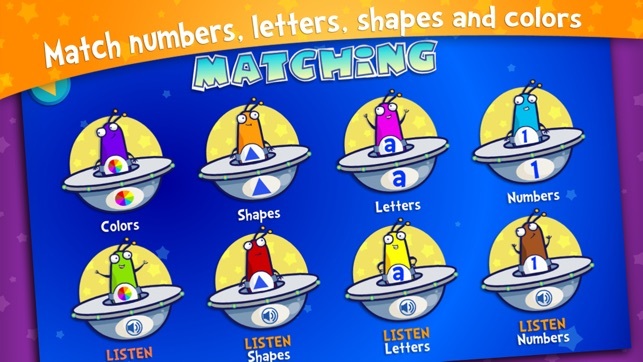 Engaging activities, varied difficulty levels and visual and audio modes let you customize the app to reinforce color, shape, number and letter learning. 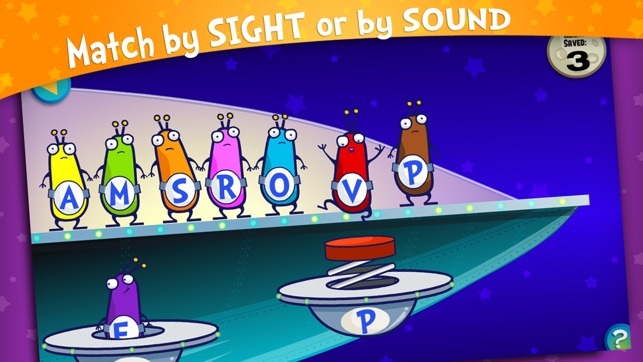 In the visual and audio Matching games, your child will rescue the cute and quirky characters while reinforcing fundamental skills: recognizing colors, shapes, numbers and uppercase and lowercase letters. The Puzzle game can be played with 4, 6, or 8 pieces providing levelled shape recognition and manipulation while developing reasoning and problem solving skills for younger and older kids. 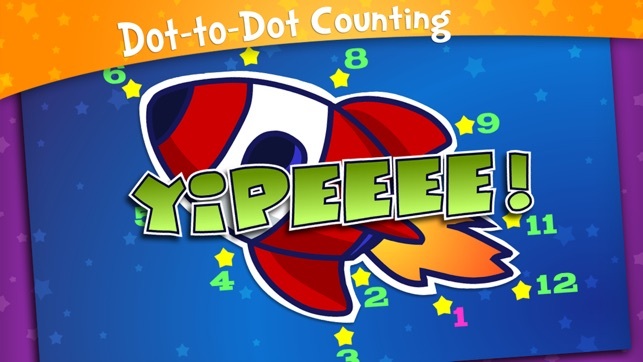 The Dot to Dot game reinforces sequential counting with audio feedback and helps develop fine motor skills as your child completes each picture. 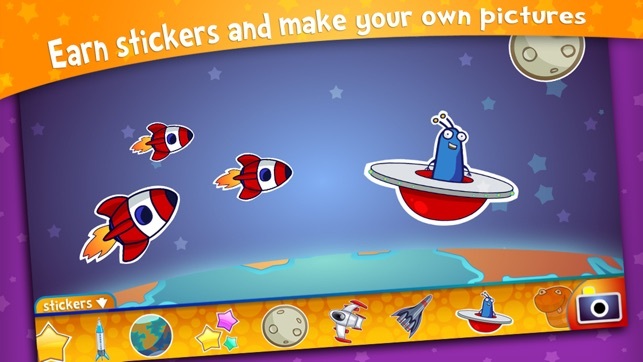 The Stickers activity lets kids use the the stickers they earn to create their own alien worlds. 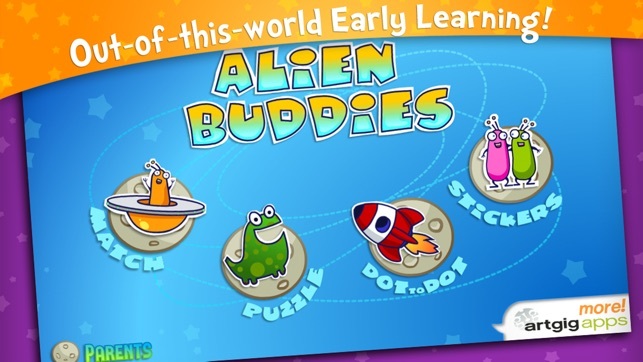 Thanks for playing Alien Buddies! 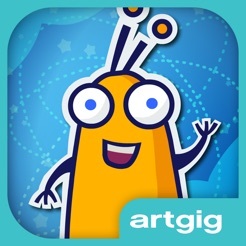 We at Artgig Apps are parents ourselves, and we hold your privacy and the privacy of your child in the highest regard. We comply with the Children's Online Privacy Protection Act (COPPA). - uses analytics to collect anonymized user data for general information about how people use our apps. If you like Alien Buddies, please consider leaving an iTunes review. My youngest played this app when it first came out and now he just showed it to his 3yr old cousin. The 3 year couldn't get enough, so I gifted it to him. Great early skills for small kids. 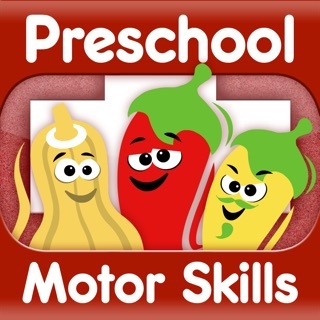 My kids love this app. 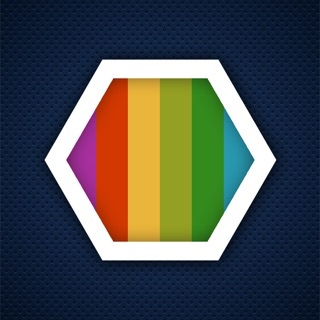 The levels increase with mastery so you can choose more challenging games. 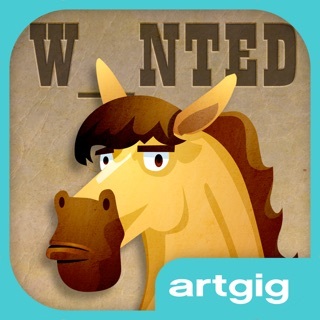 My five year old immediately fell in love with this app. He loves unlocking stickers. I love that he's learning. A Hi-quality, fun, educational good time.